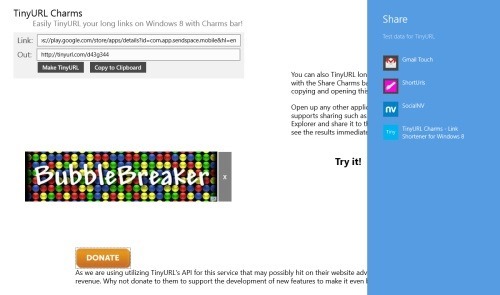 Here are 4 free URL Shortener apps for Windows 8. All these URL Shortener Windows 8 apps provide a quick and simple way to convert a lengthy web address to a smaller one and make it more manageable. Shortened URLs come with a number benefits they make more manageable links, can track & compile data, can be transformed into social media, promote sharing, and the like. Bit.Ly URL Shortener is a free Windows 8 app that lets you convert long URLs into smaller one. It is one of the most widely used URL shorteners and now after hitting the Android market and iTunes store, it is now available on your Windows 8 app store absolutely. It’s very easy to convert lengthy web addresses to smaller ones using this URL Shortener app for Windows 8. Just Enter a long URL in the given box starting with http:// or HTTP:// and click on ‘Shorten’ button to get the result instantly. You are done! Head over to the ‘Tools’ section in order to download Bit.Ly URL Shortener. Also, check out our posts on Encryption Apps, Barcode Generator Apps, and Password Manager Apps. Another popular URL Shortener app is now available at your Windows 8 app store. TinyURL Charms lets you easily convert long URLs to small so that you can easily use it for different purposes such as sharing, transform into social media services, and the like. All you need to do is just launch the app and input the lengthier in the ‘Link’ box and click on ‘Make TinyURL’ button get convert the link. You can now click on ‘Clip to Clipboard’ to copy the shortened web address. Simple as that! The interesting thing is that you can also share the shortened link via Gmail or other Windows 8 apps from within the TinyURL Charms. Yes… the Windows 8 Search Charm is integrated with the app. Go ahead and download TinyURL Charms now. ShortURLs is a bit advanced URL Shortener app for Windows 8 as it comes with extra more features such as ‘History’ option, ‘Search’ option, etc. 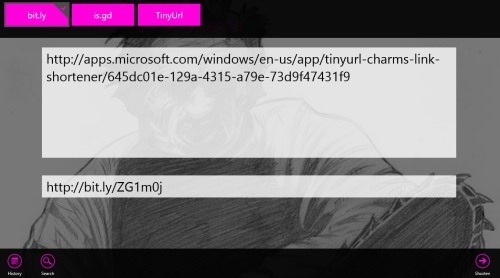 Apart from converting long web address to smaller ones, this URL Shortener Windows 8 app lets you track all the URLs which you have converted using apps such as bit.ly, is.gd, and TinyURL. The Windows 8 Search Charm is integrated with ShortURLs hence, you can easily share the shortened URLs with others from within the app. Also, you can use the Search option to search the shortened link for a specific address. It’s a quite useful and easy to use. Ending my post with this last but definitely not the least Windows 8 URL Shortener app, Short that lets you shortened the link via Goo.GL and BIT.LY. Just input the long web address in the box and click on cut-like icon given with the box. But, make sure that you have selected the service (GOO.GL or BIT.LY) via which you want to make this conversion. It’s very easy to switch between the services via sync icon. The app also lets you Sign Up Bit.Ly or Login Bit.Ly from within the app. Once you have converted the web address, now you can copy it and use it anywhere you want. Go ahead and download Short app in Windows 8 now.